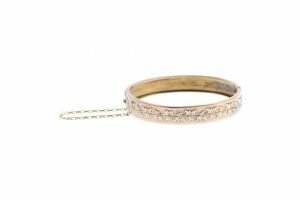 A late 19th century gold bangle, the hinged bangle with applied ivy design to the half-bangle. 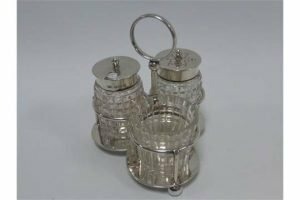 A silver four piece cruet, the silver mounted pepperette and mustard pot hallmarked Birmingham 1918, the stand hallmarked Sheffield 1919. 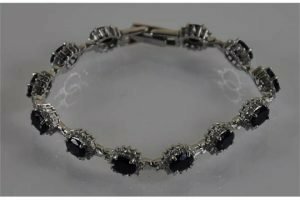 A silver bracelet of clusters, set with cubic zirconia and sapphires. 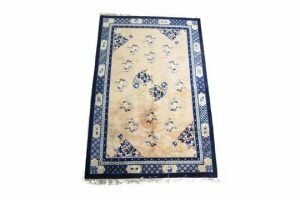 A Chinese blue and peach wool carpet, 20th century. The peach coloured field decorated with floral scenes to a key pattern guard band and border, filled with floral designs and endless knots. 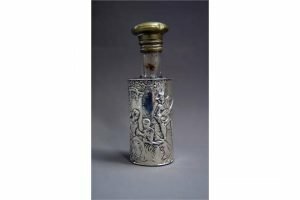 A Continental-silver and glass scent bottle with relief figural decoration, circa 1890. Total silver-weight approximately 20g. 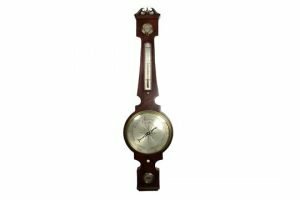 A mahogany four dial banjo barometer, the mahogany case with boxwood stringing to the edge is decorated with a swan neck pediment with a brass urn to the centre, and incorporated with a hygrometer with engraved scales indicating dry or damp above a spirit filled thermometer. The main ten inch barometer dial with a brass bezel is silvered and engraved to indicate the relevant weather patterns, with an ivory turn key directly beneath. 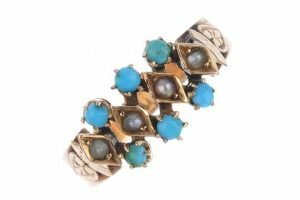 A late 19th century gold turquoise and split pearl expandable ring. The expanding lattice front, set with circular turquoise cabochons and split pearls, to the heart-shape shoulder detail. 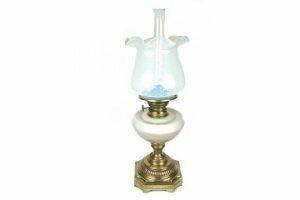 A brass and copper oil lamp with an opalescent glass shade, probably 19th century. 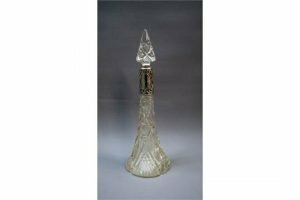 The clear glass chimney set within an opalescent frilled glass shade above an opaque white glass reservoir, the lamp supported on a brass and copper octagonal base. 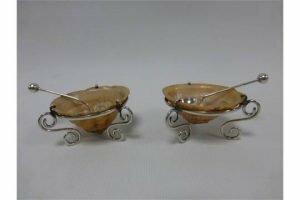 A pair of Victorian novelty silver mounted limpet shell salts, hallmarked Birmingham 1894 by maker Henry Pope, with a pair of associated silver spoons. 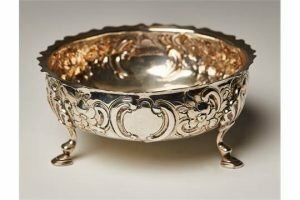 A Victorian silver circular sugar bowl with shaped rim, the sides chased with a flower and scroll band, on scallop shell shouldered legs and hoof feet, London 1879. 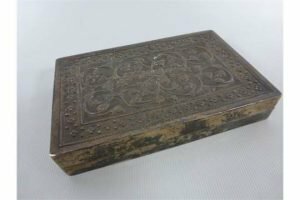 A continental silver cased wooden box with hinged floral patterned lid, stamped to base. 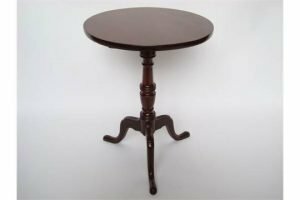 A George III mahogany tripod table, the circular top with tilt action, on turned stem and cabriole legs. 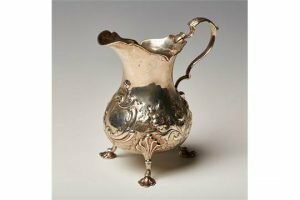 A Victorian silver cream jug with foliate capped scroll handle, the baluster body chased with flowers and scrolls, on scallop shell shouldered scroll legs and shell feet, London 1843. 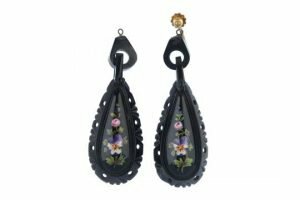 A pair of jet earrings, both designed as pear-drop shapes with openwork surrounds and lacquered, painted floral patterns to the central panels, to the screw earring backs. 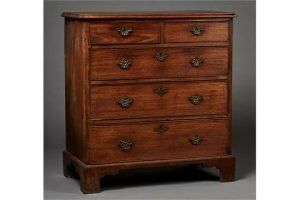 A George III oak chest of two short and three long drawers with applied brass drop handles, on bracket feet. 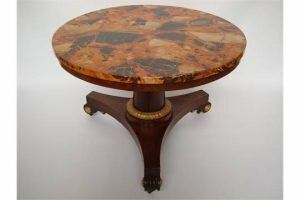 An early Victorian mahogany and parcel gilt centre table, the circular later painted simulated marble top with tilt action on tapering stem and triform base, on scroll feet and brass casters. 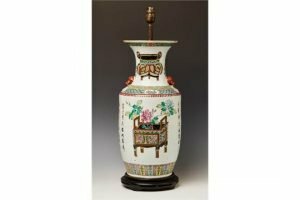 An early 20th Century Chinese famille rose porcelain vase, the shouldered body and flared neck painted with flowers and jardinières, flanked by lines of black and iron red text. 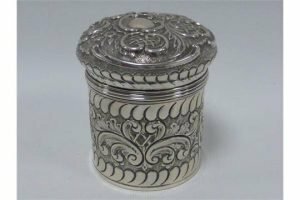 A late Victorian silver lidded jar with embossed decoration, hallmarked Birmingham 1899 by maker W M Hayes. A hallmarked-silver and cut-glass perfume bottle with its stopper. 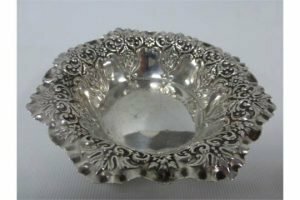 A silver bonbon dish with embossed decoration within shaped border, hallmarked in Sheffield, by makers Fenton Bros.